Dedicated in 2005, Seaman the life- size bronze is located in the 71 acre park at the Sacajawea Center in Salmon, Idaho. 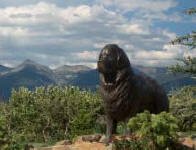 Artists: Park City, Utah metal sculptor artist Bill Kranstover and Salt Lake City bronze artist, Adrian Prazten. Dogs are allowed on site with a leash. For visitor's who forget, the Center offers the loan of leashes, while on the trails. keywords: seaman, lewis dog, salmon idaho, lewis and clark art, sacajawea and pomp monument,art and heritage, Park City, Utah metal sculptor artist Bill Kranstover and Salt Lake City bronze artist, Adrian Prazten.